We have thousands of properties for sale all over France. But we've no property for sale in Concarneau at the moment. And that's something we want to change. If you have a property to sell in Concarneau (or nearby) then act now to get a 50% discount. Just place your advert in the normal way (Click here to place your advert). Then send us an email quoting "Concarneau" and telling us that you you saw this offer. Concarneau - France's most photographed town? The old walled town of Concarneau, situated in the Brittany region of north-west France, is arguably the most photographed town in the country. Tourists flock to the ancient streets each year and shoot thousands of reels of film in an attempt to capture the beauty and romanticism of this ancient fishing town. 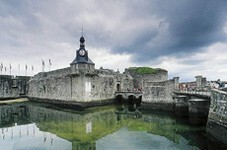 Concarneau is a town of two parts, with the old walled town (Ville Close) being the heart of the tourism trade. This charming old town, with its quaint narrow streets and atmospheric restaurants, lies in the harbour on an island linked to the mainland town by a bridge. It is undeniably busy in the summer, and some of the shops and bars are clearly aimed at tourists. Fortunately there has been a modicum of sense applied to the planning, and unlike many other picturesque towns, Concarneau has retained its identity and has not been ruined by tourism. The old town is not all there is to Concarneau, however. The modern town... or relatively modern... is also a lively and attractive place to spend time. There are plenty of facilities, and the town is well equipped for permanent living with all the necessities such as educational establishments, social services and health care. The fishing harbour, whilst close to the old town, is not actually part of it, and is in fact a fascinating place in its own right. Don't miss the fish auction, held early in the morning... if you can handle the smell at that time of day! It gives a whole new meaning to fresh seafood. You see the catch of the day arrive on the boats, be sold to the highest bidders and taken off to the restaurants to be served on your table in a few hours time... now that's what I call fresh! Dish of the day? Tuna is always a good bet in Concarneau. There are lots of very good restaurants in both parts of town, and although seafood is far and away the most popular theme, you can find a handful of pizzerias and even a vegetarian restaurant. Concarneau is proud of its Breton identity and also of its seafaring traditions. The town has a very interesting fishing museum, and this is located within the walls of the old town. There is also a yearly festival called the Fêtes des Filets Bleus (the Festival of the Blue Nets). This is named after the traditional blue fishing nets used by Concarneau's fishermen, and is a wonderful celebration of everything to do with the fishing industry, including the evocative music and traditional dances. It takes place in the middle of August... catch it if you can! Other things worth doing include taking a boat trip to the island of Glénan, just off the coast, and this could maybe even include some sailing lessons at the island's famous sailing school! If sailing isn't your bag you don't have to travel far to find plenty of other activities, and there is easy access to golf, horse-riding, swimming, tennis and many other sports. To access Concarneau you can choose to fly to one of three nearby airports, Rennes, Dinard or Lorient, with a choice of airlines. Rennes is served by flybe and Aer Lingus, Dinard by Ryanair and Aurigny and Lorient by Aer Arann. The ferry ports at St Malo and Roscoff are the nearest for boat travel although Cherbourg, Caen and Le Havre are also within reasonable reach. There's good news and there's bad news if you are looking to purchase a property in Concarneau. Property prices in the Finistère department are generally accepted as the lowest in Brittany but this is tempered by the fact that Concarneau is situated in highly desirable spot on the coast, and is extremely picturesque as well... both factors that tend to keep prices high. One thing that is certain, though, is that if you do find a property to buy here you won't regret it, and if there is ever a time when you are not using the property yourself there should be no shortage of holidaymakers wishing to rent it from you for a week or two. Do you know Concarneau better than we do? Do you have photos of Concarneau? Concarneau is situated in the north-west of France, on the Atlantic coast. It lies in the south of the Finistère department. Access: By air: Fly to Dinard (Ryanair, Aurigny), Rennes (flybe, Aer Lingus) or Lorient (Aer Arann). By boat: The ferry ports of St Malo and Roscoff are the closest to the town, although Cherbourg, Caen and Le Havre are also within reasonable reach. Economy: The economy is now principally based on tourism, but the fishing industry is also important. Interesting fact: The fishing port is the third largest active fishing port in France.